Joan is a native to the Grand Rapids, married and a mother of two adult children. She is a graduate of Calvin College with a psychology/sociology degree and earned a Master of Social Work from Grand Valley State University. 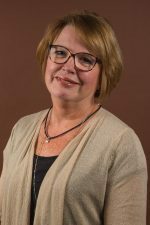 While working at the Christian Counseling Center she has been involved with a number of social work opportunities as well as in the outpatient counseling setting. Joan recognizes that she is privileged in being part of a faith community (family, friends, church, work, and activities) that encourages spiritual, physical, emotional, mental and relational growth.